Acne is a common problem among most teenagers and many adults. Although, there are many treatments for this condition, it usually takes a combined treatment of eating the right type of diet, using the right cleansing products and potentially seeking treatment by a dermatologist. When it comes to cleansing, choosing the best natural face soap for acne may help reduce the number and severity of breakouts. However, finding such a soap is not always an easy task so we thought we would help by shortly reviewing some of the best natural acne soaps. Made in Nigeria, Dudu-Osun African Black Soap is made for all types of skin and is said to be good not only for acne sufferers, but also people with eczema, psoriasis and dermatitis. It contains some good ingredients designed to improve skin texture and health such as pure honey, shea butter, osun (camwood), palm kernel oil, cocoa pod ash, palm bunch ash, glycerine, aloe Vera, lime juice & oil. The only ingredient which I can’t find whether it is natural or not is the fragrance. Apart from that, the rest of the ingredients are all natural and have anti inflammatory, antibacterial, moisturizing and soothing properties. For example, Shea butter is moisturizing, healing and antibacterial while camwood is antimicrobial. The cocoa pod ash derives from the shell of the cocoa fruit and is the main ingredient together with the palm kernel oil that give this soap its identity as African black soap. Still, it is better when African black soaps contain plantain skin which is a major component in those soaps. 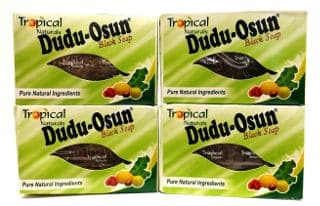 Dudu Osun soap is rated very well by reviewers. It has an extremely pleasant aroma and it lathers up well. After rinsing, their skin feels softer and doesn’t feel as dry as with other common soaps. Using this soap for anywhere from a few days to a few weeks, the majority of them report that it helps reduce their acne with some stating that it also relieves eczema itching. Finally, they like the fact that it is good at removing excess oil from their skin. Grisi Sulfur Soap for Acne contains both Sulfur (known to help heal acne and reduce breakouts) and Lanolin (which leaves skin feeling soft and smooth.) It comes in a package of 6 bars with each bar weighing 4.4 ounces each. 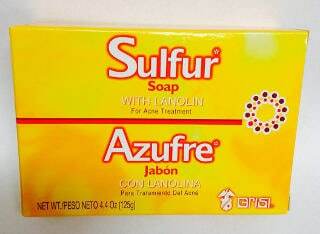 According to the producer, this sulfur and lanolin soap should improve acne slowly within 8 weeks of use, depending on the severity of each case since it contains antiseptic, anti-fungal and antibacterial properties which will help to improve the overall health of your skin. It is suggested that you use this soap at least 2 times a day and that you apply it to your face and leave it on for several minutes prior to rinsing it off. Grisi Sulfur soap gets very positive reviews with people saying that this is a creamy soap, but if used too frequently, it can be drying. However, the majority of them mention that it is soothing and great at reducing excess skin oil. Several also report that it relieves acne redness and actually seems to help heal cyst like acne while in general, it works great on the face and on the acne breakouts on the chest and back. 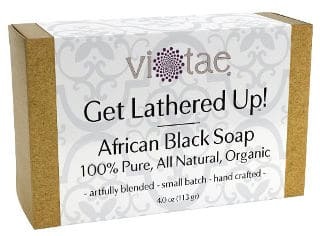 The Vi-Tae African Black Soap is a certified organic aromatherapy herbal bar soap that not only helps to fight acne, but also has anti aging properties and can be used to help you relax after a stressful day. It is followed by a 1 year full money back guarantee. This luxurious soap is handmade in the USA and contains charcoal powder that actually pulls dirt and toxins from the pores. It features plantain leaf powder which stimulates collagen production and is rich in anti-oxidants and oils to soften the skin. It contains no parabens, alcohol, dyes or artificial fragrance. According to the Vi-Tae company, this product will also help to repair damaged skin. Reviews for the Vi-Tae soap are great with the majority of users supporting that this organic soap is “as good as they can get.” They find that it lathers well and feels good on the skin. While few people mentioned that it dried out their skin, most did not experience any drying effect. In fact, they said that it does not leave a film on their skin, it is long lasting (if dried after each use) and relieves itches from rashes. They also add that their skin becomes softer, its tone is greatly improved and it does help to reduce acne breakouts. Overall, their complexion looks and feels healthier after using this product for a few weeks. Dead sea salt is said to have healing qualities and Adovia Natural Dead Sea Mud Soap contains dead sea salt as well as a number of other nutrients to nourish your skin. This is a 100% natural soap which can relieve acne while keeping your skin moisturized and hydrated. It gets very good reviews with the majority of users finding several benefits when using it to wash their face or to shower. Few users mentioned that it made them itch. From my personal experience with an all natural African Black Soap, I can say that I got a tingly sensation in the very beginning of having the soap on my skin which disappeared after rinsing off and was not there when I used it the next day since my skin got used to its soap function. Still, what I do is not to leave the soap on my face for long. According to other reviews I have read about African Black soap, people use it only a couple of times every week since it is strong enough. This or other similar effects that the African Black soap can have does not mean that it is a bad product but it means that you should use it the right way and not overdo it with its use. Something similar might happen with the Dead Sea Mud Soap. Maybe the person that experienced that itchiness had the lather on her skin for quite long or her type of skin might not have been the right for this soap. These types of skin such as the African Black soap or even probably the Dead Sea mud soap are not suitable for dry types of skin. 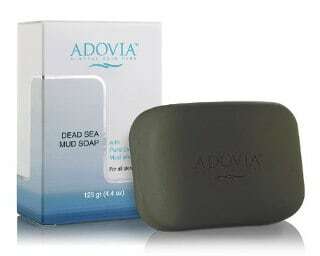 Back to our Adovia Dead Sea Mud Soap review now, people find that it works well to exfoliate dead skin cells and to remove excess oils and dirt from the pores, all of which helps to reduce acne breakouts. Most users actually felt that it hydrated their skin and left it feeling cleaner, softer and healthier than they had expected. Several people with sensitive skin stated that it was the only soap that did not cause irritation while they also loved its light natural scent. Besides, few users reported that it reduces psoriasis symptoms and eases the discomfort. The Aspen Kay Naturals Dead Sea Mud Soap bar is 100% organic with activated charcoal as well as organic oils and butters such as olive oil, shea butter and palm oil. It is handmade the old fashioned way and the company claims that it exfoliates the skin, tightens pores, moisturizes and even improves circulation. It is also effective in relieving skin disorders such as acne, psoriasis and eczema. Suitable for all types of skin, it can be used as a face and body soap appropriate for both adult men and women as well as teens. 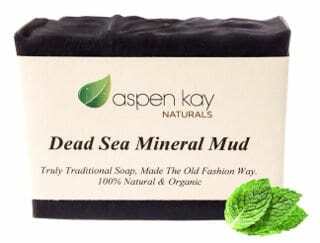 The Aspen Kay Naturals Dead Sea soap gets excellent reviews. Users like its light lemon/lemongrass smell and find it extremely refreshing. They also say that this product does a great job at removing excess oil from their skin without causing dryness, and it reduces acne. Not only does their skin feel refreshed, but it also becomes smooth and soft. Overall, they think that although it is a little pricey, it is worth every penny as continued use seems to only make their skin more healthy and glowing. In conclusion, the above best natural face soaps for acne offer you a good starting point to find a soap which will help you improve your skin’s condition and reduce those acne breakouts. Just remember that it may take some weeks for any skin product including soap to have an effect on acne, so give any acne reducing product you try a chance before deciding it simply does not work for you.